Survivor: Edge of Extinction castaway Keith Sowell is opening up about his apparent feud with Chris Underwood and what allegedly truly sparked the tension between them. Survivor viewers are well aware Chris muscled his way into grabbing the advantage Keith had found on Extinction Island -- which allowed a player to practice for the comeback challenge -- but Keith claims there's a deeper reason why he wasn't a fan of Chris. "That [advantage steal] was definitely my lowest moment! That was my valley. After he got the advantage, everything went downhill," Keith told Entertainment Weekly. "When I'm stressed to that extent, I pray because that's my safe space. At that point, Chris says, 'Oh, you prayin' now?' and continued to, what I believed, insult my faith which is off-limits for me." Keith added, "A culmination of things led to a breakdown that I take joy in overcoming, and developed this whole David and Goliath dynamic." Keith, however, ended up finding an advantage of his own resting in shallow water on Extinction Island. Keith was able to force one of his fellow previously voted-out castaways to untie extra knots in the comeback challenge, and without hesitation, Keith gave it to Chris. But neither of the guys ended up winning the "Edge of Extinction Challenge," as Rick Devens ended up taking the cake and re-entering the original Survivor game. That left Keith, Chris, Reem Daly, Wendy Diaz, and Aubry Bracco with a choice to return to the Edge of Extinction or quit the game and head to Ponderosa. When Survivor host Jeff Probst announced these players could continue their time on Extinction Island, everyone cheered and seemed ecstatic. However, seemingly minutes upon their return to the barren and lonely island, Keith and Wendy decided to raise the sail and exit the game for good. "As soon as I heard 'another chance,' of course the first thing I do is jump at that! I was so excited!" Keith explained to EW. "But when you get off the boat, step back on Edge of Extinction, and immediately start getting firewood again, you realize that literally nothing has changed." Keith said the realization of his days to come made him "start to evaluate" things. "You realize Edge and Survivor the game are two different worlds. The Edge is so much more abstract. It's not as simple as 'quit.' It's what you need it to be and what you can take from it," Keith insisted. "When you get voted out and your story ends by others' control, the Edge is putting the pen back in your hand to say when the story is complete." Keith said Reem, Chris, and Aubry's stories "weren't over because they still had something to prove." Keith, on the other hand, felt he had proven everything he needed to himself. "[I] broke the limits I needed to, and my Edge story was complete," noted the 19-year-old pre-med student from Fayetteville, NC, who currently resides in Durham, NC. When Keith was initially voted out of Survivor: Edge of Extinction on Day 6 by his tribe, he hesitated whether to keep playing the game to begin with. Keith therefore prayed to God for some answers and ultimately chose to pick up a torch and head to the nearest boat. "Every time I was asked this question, or someone approached me Week 2 with 'did you pick up the torch,' I laughed! It's so laughable because I never considered not picking up that torch," Keith revealed to EW. "I was watching that cliffhanger just like everyone else was because I didn't expect to see that interpretation of me picking up the torch." Keith said he was "so angry walking out of my Tribal Council," and so of course he wanted "the final say." "Plus, anyone who knows me knows that me praying was because of how thankful and grateful I was for a second chance, not reconsideration!" Keith said. 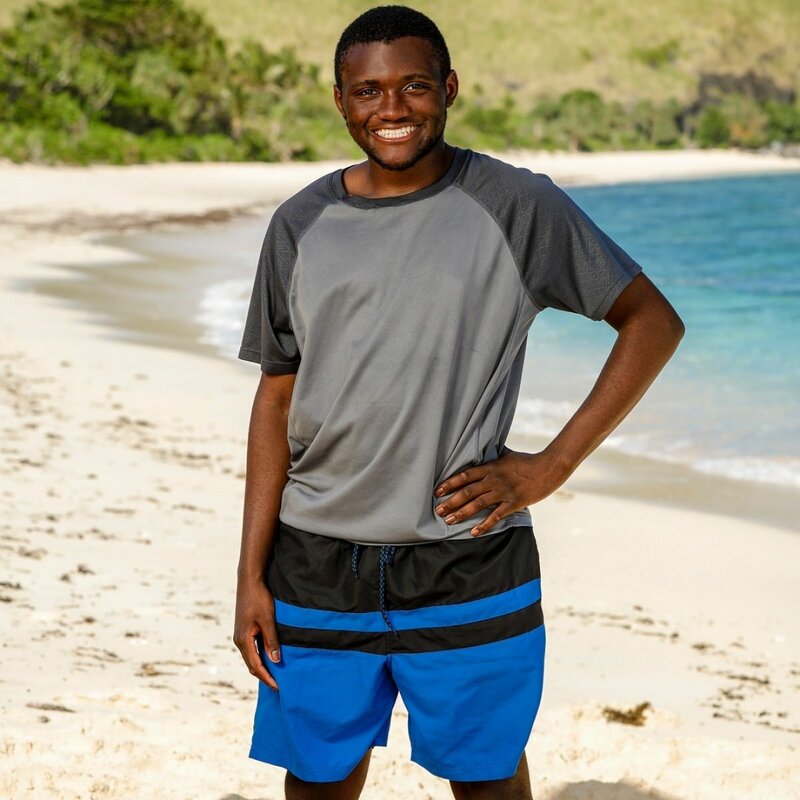 Now that Keith is out of the game for good, he was willing to share whom he's rooting for to win the $1 million and the title of "Sole Survivor." "Based on who I had interactions with, I was rooting for Reem from off the Edge because we had been there the longest and developed a friendship that was bound to extend past the game," Keith explained. "I thought being first vote had hit her hard, and knew she still had a lot to prove for herself." In terms of players who are still left in the original Survivor game, Keith disclosed his money is on returning player David Wright from Survivor: Millennials vs. Gen X. "I was rooting for David, because, despite his reputation preceding him, he is one who is capable of playing the most strategic game while being a genuine human being who doesn't cross personal boundaries or burn bridges," Keith said. Keith and Wendy decided to leave the game in a jam-packed episode that also featured the merge as well as Joe Anglim's vote off.